Oh heck yeah thanks for posting. I re-watched this a few months ago (after reading this post) and it holds up perfectly. If anything it's more resonant now. I don't have one criticism - at least not that I remember. I mean, I guess it's a White Man Saves The World movie, but a bit atypical for that trope. I don't mind the religious imagery. I'm not a Christian but it's a perfectly serviceable metaphor here. I don't find the central story all that engrossing but there is a lot of world-building going on in the background that is tantalizing -- and a little frustrating. Like.. at just about any given moment I would rather be watching the story of whoever it is that Clive Owen is interacting with but all we get are fragments and hints. Which is probably what's so enticing about it -- I suspect that any actual attempt to fill in their details would probably compare unfavorably with the mystery I create in my imagination. But anyway.. Theo is far less interesting to me than the world he inhabits. Theo is far less interesting to me than the world he inhabits. which is the point. the action hero of this movie is an old woman wielding a broken bit of staircase. Theo is just the quintessential anti-hero, and is there to simply interact with whatever happens to be around him at the time, a lot of which we don't know the background. One message is that a population confronted with imminent extinction will clutch at anything that gives them hope. There are a significant number of parallels to what is going on in the world right now. It's a movie I try to evangelise with to anyone who appreciates an intelligent story. Nerd of the North - agreed; the worldbuilding was just so freaking good that the viewer wanted early and kept wanting more of it, as much as the viewer wants to understand the history of how things got the way they were; and the pacing was well done. Michael Caine's character seems like a tremendous throwback... back to the 70's? Like, Clockwork Orange types invading a "modern" house owned by an academic? The Cannabis grow up is believable; I've never been able to pin down what the intention of this was. It felt so real, which is rather distressing. And in many ways I feel like we've surpassed this dystopia: closing borders, militant police state, profiling women and people of colour, migrant crisis. We're already there. We were already there in 2003, possibly worse. whatever happened to those black sites? the action hero of this movie is an old woman wielding a broken bit of staircase. Along with a lot of other ideas that the film is deeply sceptical of, “using violence to solve problems” isn’t cast in a very favorable light. I should probably own up and say that I’ve watched this film several times and evangelise it to people who haven’t seen it. As others have noted above, Cuarón was quite prescient in the trends that he identified, and as real life converges with the bleak vision of the film, I’ve found subsequent viewings harder and harder. As a result, I haven’t seen it in a year, maybe two, but I find myself thinking about it more and more and more. Caine's character is a retired photojournalist with a radical political background who may have been both politically and journalistically active as far back as the 1970s, although given the film's timeline, the 80s or 90s fits with his age better. Cuaron is not necessarily referring to American or English academics, journalists, or artists - I understood Caine's character to be a portrait of aged dissenters associated with Mai '68, or caught in the bloodbath on the Zocalo in Mexico City, or persons held in the Santiago stadium following September 11, 1972 in Chile. The Beast is active, he is telling us, and it waits actually next to us at our campfire. Both Cuaron and the novelist appear to view love as the answer, which is valid, I suppose. I should note that this was the last film I paid money to attend on initial release and walked out knowing I had truly seen a great film, a film that would lead to multiple rewatching and years of reflective moments. Partly it was Cuaron's technical bravura, from the initial bombing at the coffeeshop to the surreal "long take" as Owen's character walks through the bus and into the apartment block. Mostly, though, it was the merciless worldbuilding. After writing these posts, some idle Googling surfaced some corrections and possible useful info. ITEM: Caine's character was not a photojournalist, he was a cartoonist, probably of the single-panel editorial page variety. It was his dementia-or-Alzheimer affected wife who was the photojournalist. ITEM: Caine's character's name is Jasper Palmer. The nature of his relationship to Theo is never made explicit, but seems to be at least in part suggestive of mentorship or even paternality. ITEM: Rando sites on the intarwebs assert Caine developed the character with the intent that he be similar to an aged John Lennon. All you need, it would appear, is indeed love. Also, here's Anthony Lane's 2007 review, in which the film's teamed (logically) with our hermano Del T's "Pan's Labryrinth". 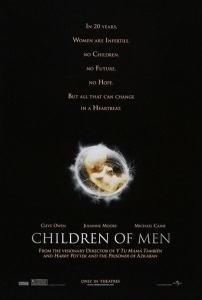 I can say for sure I was not dragged into seeing "Children of Men," I was excited for it, and remain so. This is a great movie. The worldbuilding, as noted, is fabulous - especially all the background digital and grafitti'd exposition. It makes a pretty good prequel/companion piece to Handmaid's Tale, although this telling is much more hopeful. It makes a pretty good prequel/companion piece to Handmaid's Tale, although this telling is much more hopeful. It almost fits that Children of Men is what's happening in the UK while The Handmaid's Tale happens in the US. One of the background elements in CoM is that New York was destroyed by a nuclear bomb - this could easily be "The Colonies" where criminals in THT are sent to clean up toxic/radioactive waste. So, this thread made me go back and watch the movie. All the normal amazing stuff still applies - the background details doing the heavy lifting of exposition, that amazing tracking shot, hell - a million other great shots. I was really taken in by some of the great sound and musical selections. 1. "Court of the Crimson King" as the song choice for - I think it was - Theo going to meet his cousin the "art guy" and then seeing David and Guernica and whatever else. I thought immediately of the Elgin Marbles and whatever other looted treasures are already in London. Theo's question is devistating: "Why do you even bother collecting this stuff no one will even be around to look at?" .... (eats pill) "I try not to think about it." 2. Theo talking about the persistent ringing in his ear after the opening bombing and Julian responding that it is his ear cells dying, and he'll never experience that frequency again so he should enjoy his last moments of it. Then, of course, during that amazing tracking shot when Julian is shot and there is that ringing through that last part of the scene. That part of you is dying, hold on to it while you can. 3. The alternate version of "Ruby Tuesday" for Jasper's final scene. The Stones (who are probably cheaper to license than The Beatles) are the very definition of British Invasion. But, this alternate version is sung by an Italian and the listener can't help but notice - something British mixed with something immigrant. In a film where nativism is such a strong theme, I think that's at the very least a very clever choice and at best a choice that is really thought and insightful in ways I'm not really a strong enough cinemaphile or lit major to describe. absalom, beautiful insights. I am now prompted to view it again with an ear to the soundtrack. 1. "Court of the Crimson King" as the song choice for - I think it was - Theo going to meet his cousin the "art guy" and then seeing David and Guernica and whatever else. Included in "whatever else" is another music reference - the Ark of the Arts is based in Battersea power station*, and the pig from the front cover of "Animals" by Pink Floyd is floating in the background. Although I actually came to the thread to point out that there's apparently a reference in "Children of Men" to "Possession" by Andrzej Żuławski. I just rewatched "Possession" and noticed that Anna continually talks about Faith vs Chance. The only other place that I've heard these two concepts directly contrasted is in "Children of Men", during Jasper's explanation to Miriam and Kee regarding the death of Julian and Theo's kid. *which at the time of filming had still not been redeveloped. It's reimagined as something more like Tate Modern, the former Bankside power station - which was used for the interiors. More details on Tate Modern / Bankside; Battersea power station; and Children of Men filming locations.